A comment by a visitor to the South Fremantle home of owners Anna Kanaris and Arthur Clarke of Artitja Fine Art back in 2003 changed the course of their lives. “Walking into this house is like walking into an Art Gallery”, the visitor said. Without realizing it the couple had inadvertently turned their house into a Gallery which five years later has become a well established Indigenous Fine Art gallery operating in South Fremantle by appointment, and specialising in art from some of the finest, to the newest, emerging artists of the central and western desert, and the Kimberley. “We didn’t mean to turn our home into an art gallery – it just morphed into one” explained Director Anna Kanaris. “We were very interested in art from the region and began collecting for our own walls and from there upon request began sourcing work for friends. The word got around and the client base grew and grew. We don’t just sell art, we focus very much on the culture and feel we have a responsibility to educate the public, knowing that for us it is a great privilege to be allowed into the artist’s lives and their communities” Kanaris explains. In order to reach a wider audience, Artitja Fine Art exhibit up to four times a year in a rented space – such as Earlywork in South Terrace, the Atwell Gallery in Alfred Cove and also at the Old Royal George in East Fremantle. Outside of those times, they operate strictly by appointment, and as a wind-up event at the end of the year they have a weekend home show, this year being held on the 6th and 7th December – a great way for people to view contemporary indigenous fine art in a home environment and envisage it in theirs. The show will feature an array of beautiful and affordable works from well known Indigenous artists through to younger, newer artists as well as art books, diaries, and licensed indigenous design cushion covers – great gifts from Christmas and special occasions. A special feature will be weaves by Nyoongah Bush Sculptor Janine McAullay Bott, whom Artitja represent. The Artitja Fine Art Home Show is on from 11am – 6pm December 6 & 7th, and attendance is by enquiry to Anna on 9336 7787 or 0418 900 954. 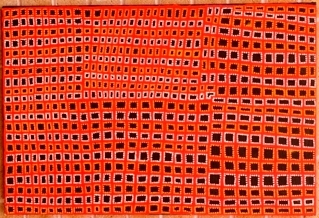 Artists: Variety Of Artists From The Eastern And Central Desert And Weaves By Nyoongah Bush Sculptor Janine McAullay Bott.